Inspired by the works of photographers Mathew Pillsbury’s Screen Lives and Hiroshi Sugimotos Theatres projects. Technology has interconnected human kind in new and exciting ways. A recent study suggests that for the first time we spend more time online than we do watching TV. However all this technology and the rise of the smart phone has added additional demands on our attention. 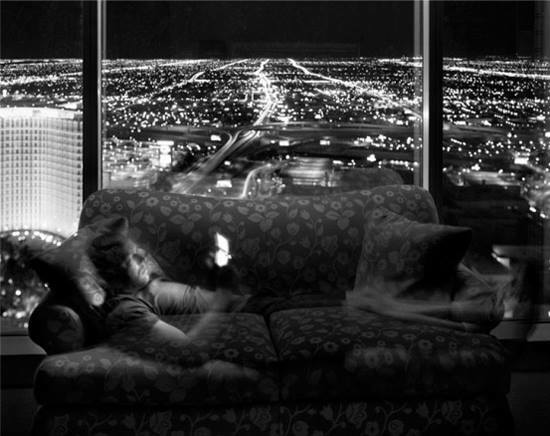 Photographer Matthew Pillsbury foresaw the effects of being con stantly surrounded and drawn to screens in our everyday lives. His beautiful images are of people in their own environments, lit only by the light of their screens. This is achieved by using long exposures. His subjects continue with their everyday lives and are seen as blurred ghostly figures, when they are motionless, they are recorded in more detail by the light of the screen. Hiroshi Sugimotos Theaters came about as a challenge to shoot an entire movie in one frame. His images of old American movie palaces and drive-ins were taken with a folding 5×4 camera and tripod. Sugimoto opened his camera shutter and exposed the film for the duration of the entire feature-length movie, with the film projector providing the sole lighting. The architectural details and the seats of the theatre are recorded in a eerie light with in only a few traces of the audience just visible due to the long exposure. Using these two great photographers work as inspiration, we would like you to photograph people lit by the screens that surround us. They must be a long exposure and prominently lit by the light of display screens. These can range from something as large as a cinema screen to the size of a smartphone. From waking to going to bed, we will encounter many displays in our modern lives, some for information, for work, for our entertainment and for connecting to others via the internet. We would like you to record these moments of interaction in your own lives and of those around you on film. – Images must be shot on Black and White film – no digital allowed. – Pictures must include a human subject. – If the subject can be identified please ask their permission. – The pictures must be a portrait/self portrait, of person/people lit by screen technology. – Indoor and outdoor scenes are acceptable. – All cameras/formats accepted but we have a preference for medium or large format. – Images to be wet printed by hand by the photographer or printed by Leicester Lo-Fi for a small fee if the negatives are submitted. – Prints must be a minimum of 12 inches on their shortest side. – Mounting and framing will be carried out by Leicester Lo-Fi but frame costs must be met by the photographer. Costs will be kept to a minimum. – The project will be exhibited in Leicester in July/August 2017.